BERGEN, Norway, 16, May 2018 /PRNewswire/ -- BerGenBio ASA (OSE: BGBIO) announces that the company and its collaborators will present new interim clinical and biomarker data from its extensive Phase II clinical development programme with bemcentinib, a selective, oral AXL inhibitor, at the 2018 annual meeting of the American Society of Clinical Oncology (ASCO) at McCormick Place in Chicago, IL (1-5 June 2018). Abstracts are now available online at https://am.asco.org/ and details of the presentations are below. The posters presented at ASCO will be made available on www.bergenbio.com in the Investors / Presentations section following the sessions. Phase II open-label, multi-centre study of bemcentinib (BGB324), a first-in-class selective AXL inhibitor, in combination with pembrolizumab in patients with advanced NSCLC. Identification of predictive and pharmacodynamic biomarkers associated with the first-in-class selective AXL inhibitor bemcentinib across multiple Phase II clinical trials. Analysis of anti-leukemic activity, predictive biomarker candidates, immune activation and pharmakodynamics in R/R AML and MDS in response to treatment with bemcentinib (BGB324), a first-in class selective AXL inhibitor, in a Phase II open-label, multi-centre study. A randomized Phase Ib/II study of the selective small molecule AXL inhibitor bemcentinib (BGB324) in combination with either dabrafenib/trametinib or pembrolizumab in patients with metastatic melanoma. Coinciding with ASCO, BerGenBio will host a reception for collaborators, investors, analysts, media and other interested parties on 2 June at The School of the Art Institute Ballroom in Chicago. At this event, short presentations will be given by clinical investigators participating in the bemcentinib clinical trials and by KOL experts in AXL kinase function. For further details and to receive an invitation, please click here or email: asco2018@bergenbio.com. The presentations will be made available on BerGenBio's website in the Investors / Presentations section following the event. 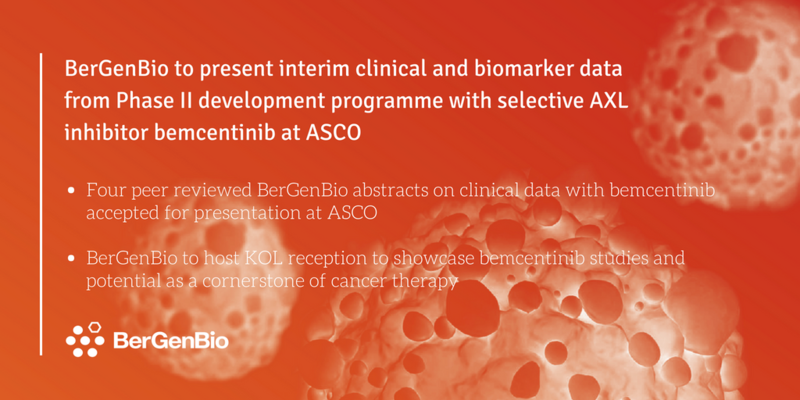 BerGenBio ASA is a clinical-stage biopharmaceutical company focused on developing a pipeline of first-in-class AXL kinase inhibitors as a potential cornerstone of combination cancer therapy. The Company is a world leader in understanding the essential role of AXL kinase in mediating aggressive disease, including immune evasive, drug resistant, metastatic solid and haematological cancers. BerGenBio's lead product, bemcentinib (BGB324), is a selective, potent and orally bio- available small molecule AXL inhibitor in four Company sponsored Phase II clinical trials in major cancer indications, with read-outs anticipated during 2018. It is the only selective AXL inhibitor in clinical development. Bemcentinib with KEYTRUDA in triple-negative breast cancer (TNBC). The clinical trials combining bemcentinib with KEYTRUDA in adenocarcinoma of the lung and TNBC are conducted in collaboration with Merck & Co., Inc. (Kenilworth, NJ, USA), through a subsidiary. In addition, a number of investigator-sponsored trials are underway, including a trial to investigate bemcentinib with either MEKINIST® (trametinib) plus TAFINLAR® (dabrafenib) or KEYTRUDA in advanced melanoma, as well as a trial combining bemcentinib with docetaxel in advanced NSCLC. BerGenBio is simultaneously developing a companion diagnostic test to identify patient subpopulations most likely to benefit from treatment with bemcentinib. This will facilitate more efficient registration trials and support a precision medicine based commercialisation strategy.